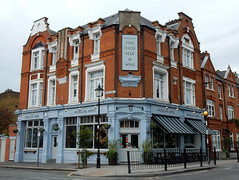 A comfortable somewhat 'gastro'-style pub not far from Mile End Station. There's plenty of space in this corner pub. The bar is in the middle of the first room as you enter, with tables stretching around the walls looking onto the street, most of them large enough to seat 4-6 people. Further tables are in the rear of the building photo, where a small area of outdoor seating is available. Shelves with books line some of the walls, and there is an open kitchen. There are three handpulls for ale at the bar, serving Landlord, Doom Bar and one other. They also have a range of lagers, including several premium ones, such as Bitburger (£3.50). Ewan visited at noon on a Saturday in March 2009, when there was no one else there, though the place had filled up well within the hour. However, there were still plenty of tables, especially in the back where I was sitting. Service was perfectly pleasant, unlike that suggested by some of the comments on Beer In The Evening. The menu is fairly short, and noticeably lacks many vegetarian options apart from salad photo of menu. There's a specials board with a soup and a pasta of the day, so I chose the spinach & coconut soup (£4.50), which was actually rather tasty and served with a large chunk of bread photo. I did have to ask for some butter, which came after a few minutes' wait. Ewan's verdict: This pub obviously attracts many of the residents of the gentrified streets nearby Tredegar Square and the Bow area, but seemed to me to be a perfectly pleasant place to spend a weekend afternoon. Quite what it's like in the evenings, I can't say. Last visited by Ewan, 14 March 2009. Last edited 2015-05-09 17:36:39 (version 6; diff). List all versions. Page last edited 2015-05-09 17:36:39 (version 6).